Knitting-related post for a change. I have to whittle down the WIPs because I cannot find any free Hiya Hiya cables! Plus the house is a mess and I’d like to get it tidied up a bit before I get kicked out. 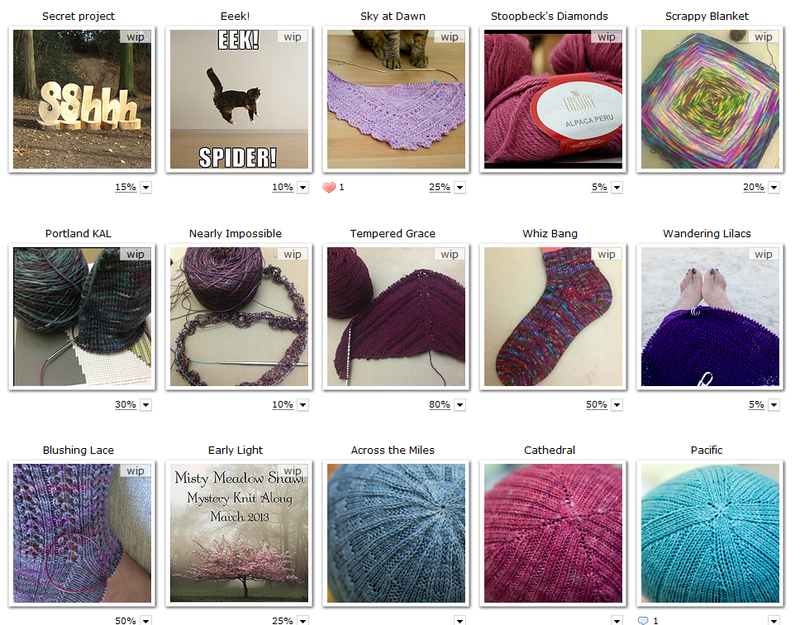 So I had a quick look at my Ravelry project page and decided to move things around. I love lists. I work better with lists. Can’t trust my memory anymore like I used to, even when I have my Ravelry page to go back to, I prefer to have a list. It makes things simpler. 1. The vest I was supposed to make for Bernie. Wrong decision to use worsted weight yarn. I’ll still make him a vest but maybe in a sport or DK weight. 2. A couple of shawls which I do not have the brain power to do right now or in the next three months. 1. Brandywine Shawl. I don’t know why it’s such hard work for me, I do love it and it’s Wollmeise so no reason to keep it stewing in the WIP pile for long. The fact that I wasn’t counting how many repeats I have might be a reason why I’m dreading this. 2. Rose’s Wristwarmers. I re-purposed the original yarn and will start this again using something similar but less hairy yarn. Alex has probably given up on me, it’s been four years after all. 1. Dancette. My second one, but with single colour. I am using the skein of Cassis WM that I swapped with Shyma. The CC is being purled and I think it gives a really nice texture to the shawl without diminishing from Carrie’s excellent design. 2. Granny Pincushion. Commissioned by the ladies of reMADE DXB, well they asked kindly and I said yes. She’s a bit fiddly but great fun! Coming along nicely but the dress is giving me some stitch count issues. I could wing it but then it may not end up looking great. Hoping to finish it before the next Amiras meeting hosted by reMADE DXB. 3. Rose’s Wristwarmers. Yes, I am confident that I can start and finish this in no time. I’ve grown as a knitter since I made the first pair and doing cables and moss stitch in the round no longer frightens me. 4. Eeek! A test knit from the talented Anke. This will be my second one for her and I am glad I said yes. It’s part of her birdsong series of sweaters and tops which I hope everyone else will love. 5. A super secret project. I can’t really talk about this one except to say that this might even get bumped up depending on the deadline from the designer. 6. Ferrous Wrap. I don’t want to disappoint my fellow Sundara Yarn Lovers so this year I am intent on finishing a project for the annual Silk Lace KAL. 7. Whiz Bang socks. It’s a short, almost ankle socks. How difficult could it be? 8. Brandywine shawl. It’s going to be finished this year! 9. Lace Rib socks. The finer gauge wore me out but it is pretty so I want to finish this. 10. Misty Meadow shawl. It was part of a mystery KAL but everyone else finished theirs while I got stuck on Clue #4 I think. The finished shawl is very pretty so that is motivation enough for me to continue. 11. Portland Gussets. My KAL with Heidi. I love the yarn, I love the colour, I love the pattern. I could only wish the other projects bore me to death so I can pick this up instead. I am going to follow this list as much as I can. At the end of summer, I will have some pretty things to show off. And I will be ready for winter. Or maybe Germany first. I know, I’m thinking too big, aren’t I? The granny is giving me a hard time because the designer insisted on writing it out as if you’re using 4 DPNs. Seriously, on sock yarn? With sometimes 2 sts per needle?! Argh!